The very nature of an outdoor kitchen is honestly pretty charming. Who doesn’t love the chance to eat a fresh meal in the sunshine, surrounded by their garden, overlooking the swimming pool? However, with a few smart design strategies, you can take your outdoor kitchens and patios to the next level. With a keen eye for color and a creative imagination, anyone can turn simple outdoor kitchen designs into even more colorful and wonderful realities. One thing all magazine-worthy outdoor kitchens and patios have in common is cleanliness. Just like indoor spaces, outdoor spaces should be kept neat and clutter-free. With good design, you can prepare an outdoor kitchen that’s a piece of cake to maintain. Simply ensure that the kitchen has plenty of clever storage solutions for hiding away would-be clutter. Include a few different sheltered trash and recycling receptacles under the counters, and use drawers to store utensils, cleaning supplies, and flatware. A refrigerated drawer is a great way to store drinks, and an under-the-bar cabinet can be a place to store extra beach towels. Outdoor kitchen spaces are meant to be enjoyed both day and night. Including multiple light sources can help make the space more useful after dark. 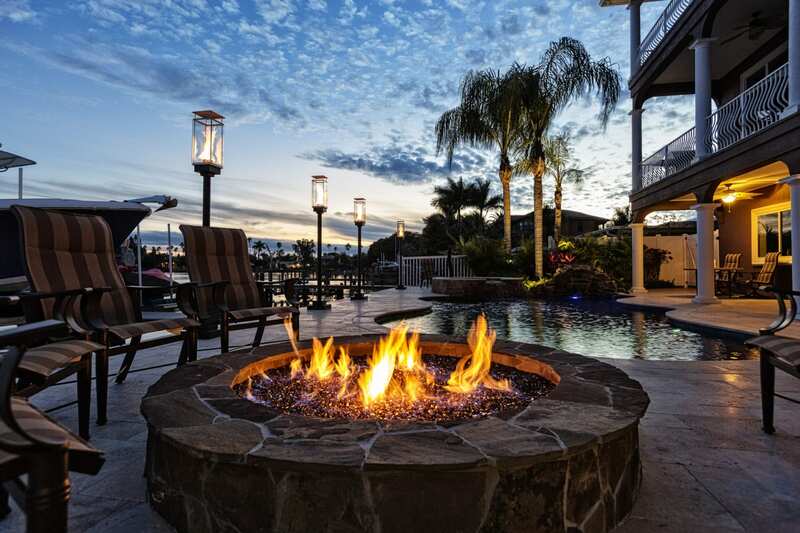 However, you can take your lighting one step further by adding an outdoor fireplace or campfire pit. This step will encourage guests to gather ’round the flickering firelight for drinks and storytelling. Adding a fire pit can keep you warm on chillier autumn evenings, and it might even keep pesky mosquitoes at bay. Many homeowners opt for simple outdoor dining spaces, but why not take your kitchen’s personality up a notch with fun colors and patterns? Save the formal dining for indoor events, and use your outdoor eating area to express creativity and flair. Choose a bright accent color, unusual seating choices, or a vibrant collection of plants to decorate your space. After all, it’s yours to use as you please, so go wild! In a 2014 Houzz Spring Landscaping Trends Study, 83% of respondents considered the backyard “an ideal entertaining space.” With these tips, you can take any outdoor kitchens and patios from “ideal” to “fun and fabulous!” For more outdoor construction inspiration, contact us at Challenger Pools today. Swimming is the most popular recreational activity for children and teens between the ages of seven and 17 in the United States. Even having the most simplistic pool on your property can be great for the whole family, but there are so many custom pool designs and pool renovations that give it an aesthetic and practical boost. Keep in mind, it’s best to work with experienced pool contractors whenever you’re upgrading your pool. Install LED lights — Conventional floodlights and other basic pool lighting can look fine, but imagine how awesome your pool will look at night with LED lighting. This kind of lighting is much more energy efficient than other options and can look incredible. Waterline Tile — Updating your pool’s waterline tile will give it a much more modern and visually appealing look. If you really want to transform your pool’s appearance, combine the waterline tile with entire deck and pool resurfacing jobs, as well. Handrails — Handrails are not only extremely safe, but they can improve the pool’s accessibility and boost its appearance, as well. Rather than installing shiny metal handrails, which can be extremely hot and even burn hands in triple-digit temperatures, consider installing powder-coated handrails. Tanning Ledge — A tanning ledge — also known as a Baja step — is a large, flat, shallow surface in a pool that is extremely popular in resort pools. But you can have your very own lounge chair in your backyard pool after installing an underwater tanning ledge. Efficient Pool Pump — Though new poolside equipment isn’t exactly the nicest thing to look at, it can end up saving you money. Pool experts say a variable-speed pump can end up saving a significant amount of money and even pay for itself within one to three years. Instead of just having a plain, boring pool, consider making some aesthetic upgrades. You, your entire family, and everyone who comes over for a swim with love it! If you want to learn more about custom pool renovations and work with experienced pool contractors, give Challenger Pools a call right away. Yes, you enjoy your yard. That’s a good thing! But there’s always room for improvement, right? If that’s how you’re feeling, then you are not alone. According to the responses of 56% of the people participating in a Houzz study, people want to make their yards more friendly for entertaining. Here are five ways they are doing this. Swimming is an extremely popular sport. It is also a very popular leisure activity, and residential pools are a great feature for a home. People who are interested in improving their yards are calling pool contractors. They can find out about what is involved in having a pool installed in their yard. Do they need an above ground pool or in-ground pool? What would be best in their yard? 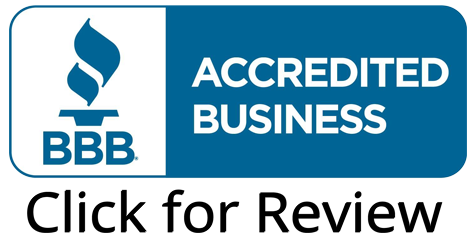 A pool contractor can also handle questions about spas and other water features for the yard and the pool area. Dramatic lighting, flowering trees, flower beds, custom stonework and more are all fantastic features that and add to the dramatic impact and monetary value of your property. One of the most popular features to add to outdoor property has to do with cooking and cuisine. 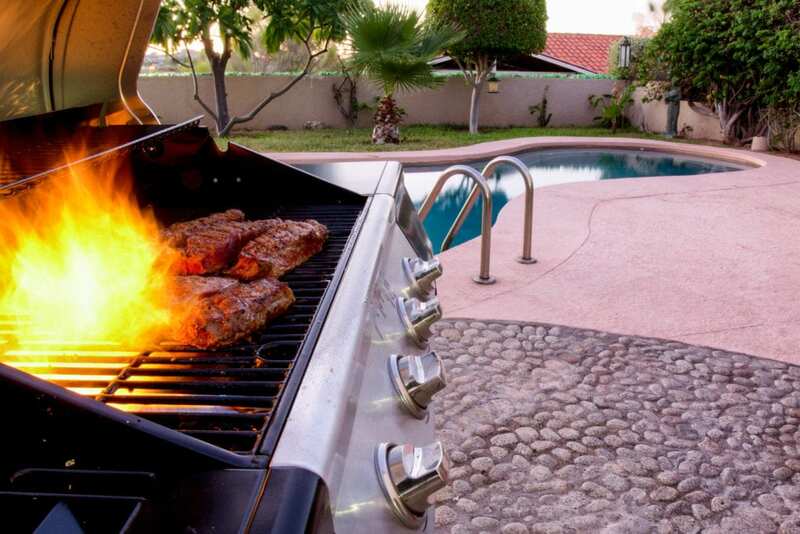 In fact, the home design site Houzz has compiled data which indicates that barbecues or grills are one of the top three selections when homeowners are making improvements their yards and outdoor areas. It has been reported that outdoor kitchens are being added to the backyards of 14% of consumers. Pool contractors will tell you that a really good reason to add a pool to your property is for your overall health and general well-being. Swimming is a wonderful exercise! A call to your doctor or your trainer will confirm this. It gives a great cardiovascular workout since it is more difficult to move in water than it is to move through the air. Water is much denser than air, actually ten times denser, so the increased resistance translates to a fantastic workout. Respondents to the Spring Landscaping Trends Study by Houzz in 2014 overwhelmingly endorsed their backyards. 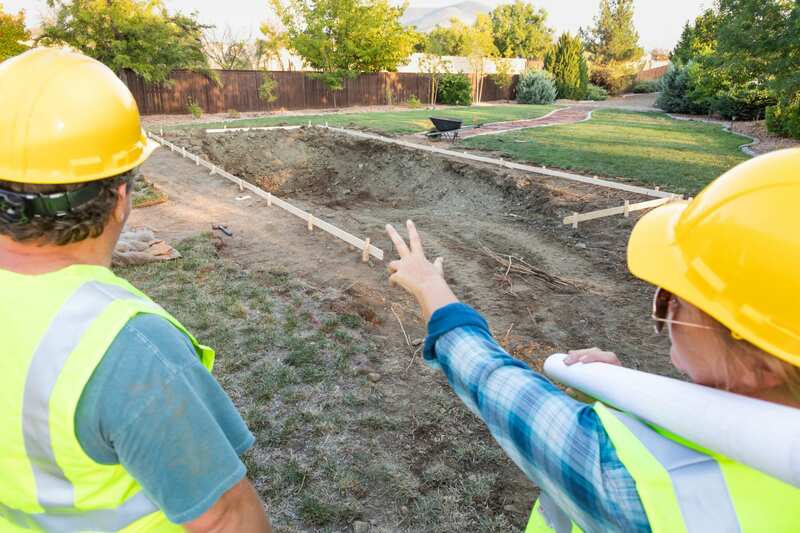 In fact, 83% said it was “an ideal entertaining space.” If you are thinking about updating your yard, professionals such as landscapers, pool contractors, and home improvement specialists will help make your dream a reality. Swimming Pool — Installing a swimming pool is the perfect way to transform a boring backyard into a vibrant one. No matter the size or shape of your landscape, there are plenty of custom pool designs that will be perfect for your property. No more hiding inside on nice summer days. Now, you’ll be able to relax by the water as your kids have fun splashing around in the pool. Outdoor Kitchen — Landscape architects who specialize in residential design were asked to rate the expected popularity of a variety of outdoor design elements: outdoor living spaces, defined as kitchens and entertainment areas, were the second most popular project at 92%. Having an outdoor kitchen on your property is perfect for throwing a barbecue and spending more time in your backyard, as well as having fun with family, friends, and neighbors. Garden — A nice garden can add character to your yard and tie your landscaping together. You can start off small, but as long as you keep working at it and focus on maintaining healthy plants, your garden will start to grow and end up looking magnificent. You don’t have to be a professional botanist or horticulturist to grow a few nice-looking and healthy plants on your property. Do a little research online, purchase some mulch and necessary equipment, and get to work on your new backyard (or front yard) garden. Don’t let your backyard go underutilized any longer. It’s time to improve the look, feel, and worth of your entire property. If you want to learn more about how some of these projects can boost your property’s appearance and value, or work with professionals who are experienced at constructing outdoor kitchens and swimming pools, give Challenger Pools a call right away!